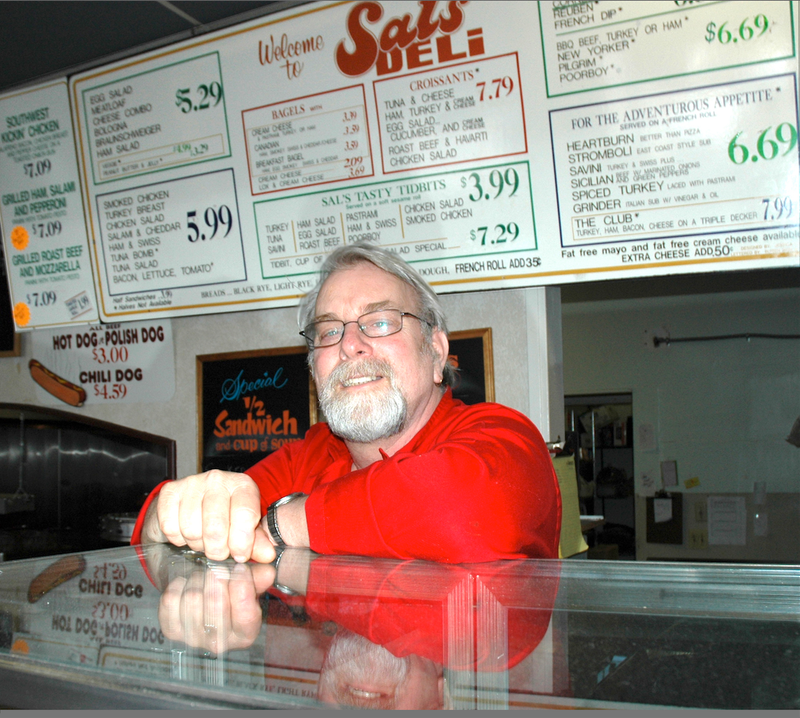 Jim Hughes,who for many years operated Sal’s Deli in Burien, died Nov. 21. Below is a story about Hughes which appeared in June, 2013. Jim Hughes was at the wheel of his Red 2003 Buick 4-door sedan on the afternoon of Jan. 13 on Southwest 128th Street, just west of Des Moines Way South. That is all he remembers of that winter day. The official report tells the tale:"64-year-old male unresponsive. He had driven his car off the road and hit a house. Pt stable: unconcious; and not breathing. Driver is only one in vehicle. The vehicle did not penetrate the house. He was extricated out the passenger side of the car." Then medics from stations 19 and 18 assisted in trying to revive Hughes. He had suffered cardiac arrest. They rushed him to Highline Medical Center. At Highline, they recommended Jim be taken to U.W. Hospital. But when contacted, Jim said, he was told later, U.W. was full. He was taken to Swedish. Three days passed before Jim awakened from a temporary coma at Swedish Hospital. He was unaware that he'd had a heart attack, lost control of his vehicle and crashed through a fence and into a house. Jim was also unaware that he was “dead” for three or four minutes until he was revived by firefighters from North Highline Fire District. Because the crash took place within a short distance from fire station 19 and because the homeowner called for help, first responders were able to get to the site of the crash very quickly. How does Jim know he was considered dead for that time period? The EMT crew happened to be working on a training video and had brought their camera gear with them. They shot pictures of the crew reviving the crash victim and plan to use the video in their training sessions. Jim brought the clip to the house one day last week when he came by for lunch. Until last November 2011, it would more likely have been me going to Jim's place for lunch. He owned and operated Sal's Deli on 4th Avenue in Burien for many years. I went there often for lunch. Jim is a dear friend. He has a cherubic smile and a kind of aw-shucks style that makes you just want to hug the guy. Jim loves Burien. He took an active role with boyish enthusiasm in the modern life of this small town. In 2008, Jim was the recipient of a Robby Award, a public acknowledgement given by The Highline Times to a local person who has shown by deed their commitment to community. In the last few years, business got a lot tougher for small operators like Jim as the effects of the recession washed over us all. Jim figured if he also started serving breakfasts, business might perk up. It did, but so did Jim's waistline. He admits the reason he began offering breakfasts is because he loves eating them. He said he ballooned to almost 280 pounds. At five-foot eight, that's a load on a pair of Nikes. Business did not improve enough. Jim decided it was time to throw in the dish towel. He tried, unsuccessfully, to find a buyer. In the end, Jim shuttered the place and auctioned the furniture and kitchen gear. Sal's Deli was finished. All Jim had left were the memories of lots of loyal customers and an expanded belt line. And a load of stress about the future. He is 64 years old. This was the second time around for Jim with a heart attack. He already has a chest full of stents from a previous bout. This time, when the doctors took a look at his venous map, they decided there was little they could add that would help him. They sent him home. Since November, Jim has lost 55 pounds. In the capable hands of his son, Alex, Jim's diet has been regulated. He plans to lose another 50 pounds, "to get down to my hiking weight." These days, he does get out. He takes short excursions, courtesy of his son and friends, which allow him to wander the world a bit. He uses a cane for balance, as the weight drops and he finds safe footing with his shrinking size. A goal is to lose the cane as soon as he can. He has high praise for the men from North Fire District and Medic 4 who saved his life. Those involved in the rescue are, from Engine 19 (the first unit there) Acting Lieutenant Eric Boutwell, Firefighter Dan Crossen, Firefighter Jeff Meagher and from Engine 18, Lieutenant Russell Kay, Firefighter Scott Thorsteinsen and Firefighter Vihn Pham; Battalion Chief Jim Reed. Medic 4 crew members Dave Ackland and Hannah Henson. And MSO 1 Medic Supervisor Keith Keller. We're glad, too, that these great public servants are there on the job all the time performing their miracles. They truly deserve our support.